Finally, the sun has come out and given us a reprieve from the constant wet weather. It is quite cold this morning, but we have to get out into nature. We decide to go for a toboggan ride. We actually live in a winter sports paradise but when the snow doesn’t come, it doesn’t help. Fortunately, there are a few places in the region that have enough snow to have some fun. Almost alone on the toboggan run. The Geisskopf is a small ski resort on which a few lifts are in operation even thought there is hardly any snow. Today it is great because despite the fantastic weather, it isn’t very busy. On the slope, of course, it’s forbidden to go sledding but there is also a little path, which is quite enough for us. Parallel to the ski slope there is even a toboggan run but we haven’t tried it today as there probably isn’t enough snow. After a few runs, Paul is able to pull up. We’re travelling with two wooden sleds. The older one we souped-up years ago so it can go down the slope even faster. Peter simply attached two old cross-country skis to the sled runners. You could polish the skis with wax if you wanted the sled to go faster. With the skis underneath it’s also much easier to ride on softer snow. Luckily I have the “light baby” and even the special sled. Paul has been really exhausting the last few days but out here in nature, going for a toboggan ride in the middle of the Bavarian Forest, he doesn’t make a dull face for a minute. Mathilda also has a lot of fun with the new activity. Today she sits on a sled for the first time! 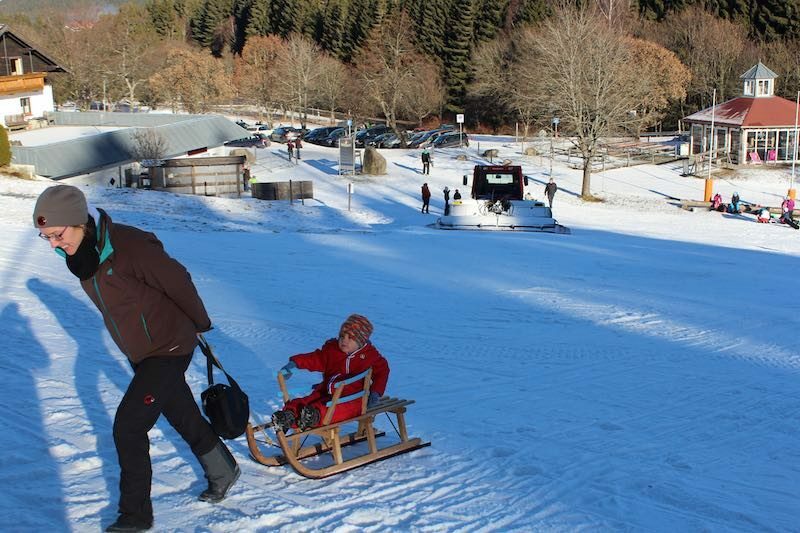 The Geisskopf is, of course, not just for sledding. 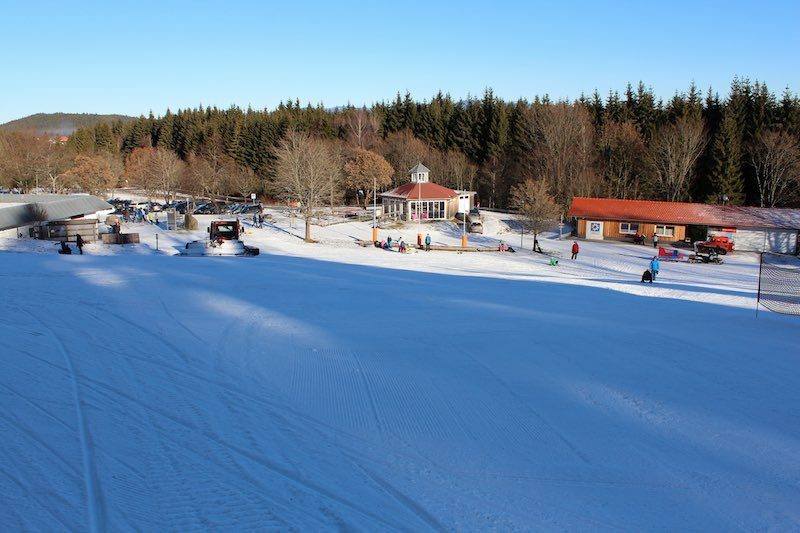 There are also nice slopes for skiers and snowboarders. On our sleds we watch a couple of kids practising snowboarding. This unknown sport is totally fascinating! Snowboarding? What is this? Totally fascinated with the kids on the board. 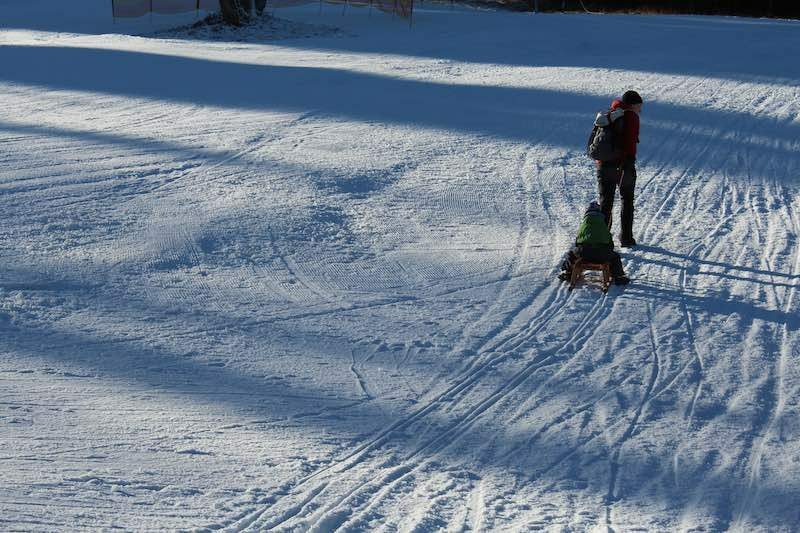 Where are your best places for tobogganing and skiing? I’m very happy to receive recommendations on dastoa. 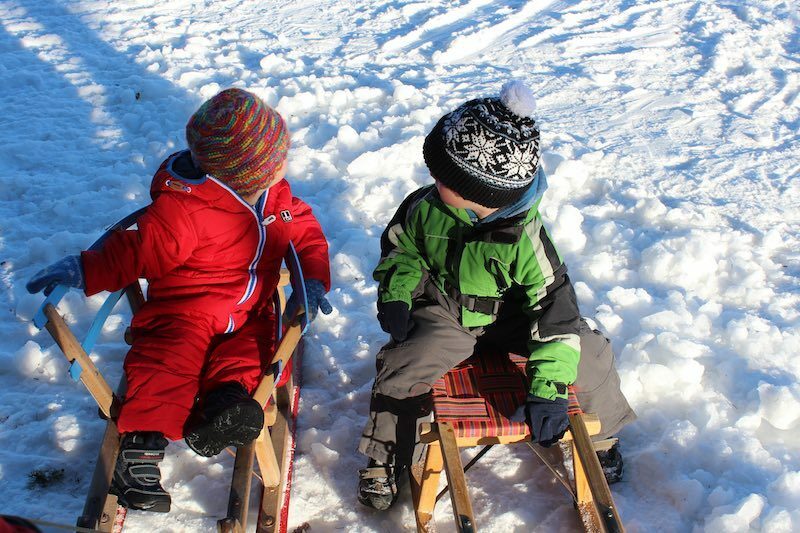 It doesn’t always have to be going for a toboggan ride in the Bavarian Forest – we’re also interested in other great places in the world for sledding and skiing.